There's been some talk about small batches on the Food In Jars facebook page lately. Obviously, small batches are great for people with small kitchens, little households or who just want to make something to save rather quickly. I was really mentally puffing up like a proud bird, and preparing to do nothing EVER on such a small scale until two things happened: a couple of packages of organic kumquats were on sale at the grocer and my daughter started to peel a not quite ripe mango. First came the kumquats. I read the Canning for a New Generation approach to preparing a kumquat preserve, and was really uneasy about the process. The boiling and rinsing three times perplexed me, but it turned out fine. The thing that ended up bothering me was that as beautiful as the translucent orbs appeared in the jar, they seemed really hard to approach from an eating perspective. I found myself wondering how on earth I'd serve a chewy kumquat in drippy syrup. Luckily, I remembered that my mother-in-law was only a shade irritated about not getting a jar of the grapefruit-orange marmalade that I made in January, so I decided to remove the seeds from the kumquats and quickly process them in my Cuisinart. I ended up with enough product to make 2 half pint jars of marmalade with about 6 ounces of just the syrup reserved for my next project. There was also just enough to smear on some buttery, slightly burned toast. To recap, I followed Liana Krissoff's recipe for Kumquat Preserves before mincing the kumquats, adding a tablespoon of pectin, a tablespoon of lemon juice, some lemon zest and boiling to 220 degrees. I processed for 12 minutes in a water bath, and checked for a good seal. 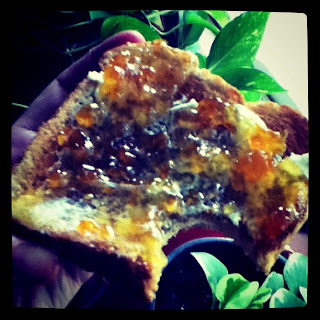 The product was delicious---a little more pungent than orange marmalade, but a surprisingly good, little batch. look for my post on how to make something special with 4 ounces of kumquat and lemon infused simple syrup and just one mango next!